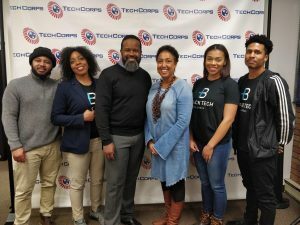 Photo (left to right): Kaleem Musa, Dawn Marbury, Doug McCollough, Lisa Chambers, Deneisha Franklin, and Matthew Quinn of BlackTech614 and Tech Corps. Talking with Doug McCollough, the Chief Information Officer of the city of Dublin, Ohio, one thing becomes immediately apparent — he’s a public servant who believes in digital inclusion. “It’s criminal that people who could benefit from technology and its advances are not getting access to it,” said McCollough. “Our entire society is becoming more digital. When you look at history and developments in technology, we’ve always seen that same attitude that innovations are the privilege of those who can afford it. McCollough calls the digital world “the space to be able to function” — likening it to advances like the telephone, transportation systems, and public schools. He says if you don’t have access to digital tools and knowledge, you simply cannot take part in or contribute to today’s society. Connected Nation asked McCollough to share his experiences and point-of-view for Black History Month to help us shine a light on the growing Digital Divide — specifically its negative impact on African Americans and other minority groups. According to the 2017 American Community Survey from the U.S. Census, more than 10.7 million African Americans in the United States do not have home broadband service, representing 27.6% of that population who are not connected (compared to the national average of 17.9% of all Americans without broadband service at home). McCollough believes changing that number and creating a more digitally inclusive and diverse country is something that is in the best interest of us all. McCollough knows what he’s talking about. He’s worked to extend broadband access in Dublin, a Columbus suburb of more than 48,000 people, and helped spread the lessons of broadband expansion to communities throughout Ohio through the work of Dublin’s Global Institute for the Study of the Intelligent Community (see below to learn more about the institute). McCollough took a somewhat winding path to his current position. He was born in Toledo, Ohio, and raised just outside of Detroit. He started his career as a musician — majoring in jazz composition at the Berklee College of Music in Boston. McCollough and his wife were later living in New Jersey, raising their children, when they decided the Midwest was a better fit for their family. That’s when McCollough decided to go back to school. He attended the University of Toledo, earning a degree in information systems, and later received his MBA from the University of Notre Dame — where his interest in technology and people management merged within a business context. McCollough worked for Alcatel-Lucent, then began working in public service — taking positions at four different State of Ohio agencies and one municipality — as the Director of Information Technology for the City of Richmond, Virginia — before arriving in Dublin. In his role as CIO of Dublin, he’s directed 100 gigabit transport network implementation and extended Dublink fiber optic system into the Dublin City Schools District; supported implementation of the 33 Smart Mobility Corridor for testing connected and autonomous vehicles; and established a device and data collection grid as part of Smart City initiatives. That’s just some of what he’s accomplished since taking the position in August 2015. But it’s his latest project that may end up being one of his most impactful. For the group, there are no limits as long as efforts are related to technology. Black Tech Columbus is doing everything from youth hack-a-thons to teach kids what they can do with technology, to events explaining blockchain, to helping big companies establish better recruiting relationships with communities of color. The point is to give everyone from African American kids to black business owners a safe space to ask questions, access resources, get new information, and so much more. Not only is Black Tech Columbus helping expand digital inclusion and digital diversity, but others are paying attention to what’s happening. As for what comes next, McCollough says he’ll keep working toward digital inclusion in his roles with the city of Dublin and through organizations like Black Tech Columbus. But he’s quick to point out that other tech professionals and city leaders should be doing the same in other parts of the country. Interested in learning more about Black Tech Columbus or developing a similar group in your town? Find them at @blacktech614 on Twitter or email the group at blacktech614@gmail.com. Description: Doug McCollough, CIO of a city recognized for Smart City and Intelligent Community innovation talks about how public and personal data will make our lives better in Smart Cities if we get past our fears.